Palau with its capital Melekeok is located in Oceania (Oceania, group of islands in the North Pacific Ocean). It covers some 460 square kilometers (slightly more than 2.5 times the size of Washington, DC) with a population of 21,431. English, Japanese and Chinese are the languages spoken by people in Palau (consider regional differences). Thiscountry has no land-based border with any other country. Palau is a group of islands in the Micronesia area of Oceania, to the southeast of the Philippines. Palau enjoys a tropical climate all year round with an annual mean temperature of 82 °F (28 °C). Rainfall can occur throughout the year, averaging a total of 150 inches (3,800 mm). Palau is most famous for scuba diving. One of the most famous dive sites - Blue Corner, with constant sharks and a high current - is located less than 1 hour's boat ride from most resorts. The topography is varying topography from the high, mountainous main island of Babelthuap to low, coral islands usually fringed by large barrier reefs. The average density of population is about 47 per km². The climate in Palau can be described as tropicalhot and humid, wet season May to November. Potential natural disasters are typhoons (June to December). To reach someone Palau dial +680 prior to a number. The local cellular networks are operated on 900 MHz, 1800 MHz. Websites typically end with the top level domain ".pw". If you want to bring electric appliances (e.g. battery chaarger), keep in min the local 120 V - 60 Hz (plugs: A, B). The sign for the locally used currency Dollar is USD. 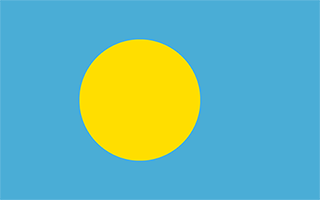 Light blue with a large yellow disk shifted slightly to the hoist side; the blue color represents the ocean, the disk represents the moon; Palauans consider the full moon to be the optimum time for human activity; it is also considered a symbol of peace, love, and tranquility. After three decades as part of the UN Trust Territory of the Pacific under US administration, this westernmost cluster of the Caroline Islands opted for independence in 1978 rather than join the Federated States of Micronesia. A Compact of Free Association with the US was approved in 1986 but not ratified until 1993. It entered into force the following year when the islands gained independence.